At the Danish design manufacturer Mater, design, craftsmanship and ethics are key words in creating a design brand that makes great design. While maintaining the quality of the right craftsmanship the founder wants ethics in production to support the idea of a greener planet, and make people involved in the production to benefit from it. At Mater, responsible manufacturing means knowing exactly who makes the products, focusing on the importance on using certified wood, raising awareness of the impact of recycling waste, supporting traditional crafts, always choosing production methods that are the least environmentally harmful. It also means reassuring the working conditions in which the items are produced, and building long term relationships with factories to ensure continuous improvement. For instance, by working closely with the independent family-driven factory in Slovenia that holds the production of the High Stool that is crafted in FSC-certified wood (ed. a label of responsible forestry). To Marstrand, it’s not just about manufacturing more. But manufacturing right—a mode of always seeking the manufactures that knows best. Lampshades in mouth-blown glass made in Czech Republic (ed. as opposed to being produced by a machine), the aluminium version of the High Stool being crafted in partly recycled old car components and casted by hand in India. “Our High Stool, which is designed by Space Copenhagen, is also a good example of our design philosophy; it looks and feels familiar and has a very distinct design language that is quite classic. It will grow on you as you use it, which is a very good indicator of what could become a classic,” says Marstrand. The Luiz Lamp is another example of manufacturing the right way. 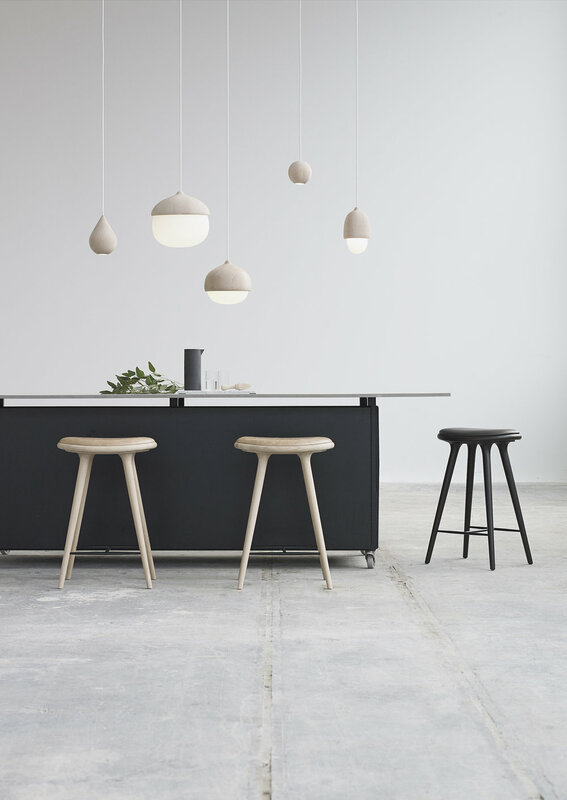 The lamp is being carefully constructed from cork from responsible managed cork oak forests in Portugal, protecting cork production as well as preserving the local biodiversity in the forests. The metal top of the lamp is made in Denmark by one of the few remaining workshops that master the spinning technique to perfection. Despite that the financial crisis in 2008 hit hard among many manufacturers, Mater’s claim on requiring ethical production generated reverberations with the consumer and the Danish design brand actually managed to grow through the financial crisis. Then people began 'to understand what the company was all about', according to Marstrand. In the future, the company will look at more new materials and more sustainable production sites around the globe, continuing to act out its three main principles. “We would love to expand our collection—offering more responsible manufactured items and to inspire consumer behaviour and engage people in sustainable thinking, making design matter and reducing our ethical footprint. For the time being we’re looking at expanding the collection in different areas, which could involve us looking at sofa collections and home accessories but still ensuring that we preserve our key values,” says Marstrand.